15 tech companies have united to condemn "discriminatory legislation" in Texas. Proposed legislation in Texas has irked some of the biggest names in tech, sparking condemnation from the likes of Mark Zuckerberg, Tim Cook and 12 other influential tech leaders. If passed, this controversial state law would only allow transgender students to use restrooms that match the gender printed on their birth certificate. While Texan lawmakers continue to debate what's become known as the "bathroom bill", the influential executives have penned a letter urging the state's governor not to pass the "discriminatory" legislation. Senior employees from Microsoft, Amazon and game developer Gearbox Software have also co-signed the letter with Facebook and Apple, claiming that the proposed law would be "bad for employees and bad for business." Governor Greg Abbott has revealed that he intends to pass the controversial bill before the end of May. 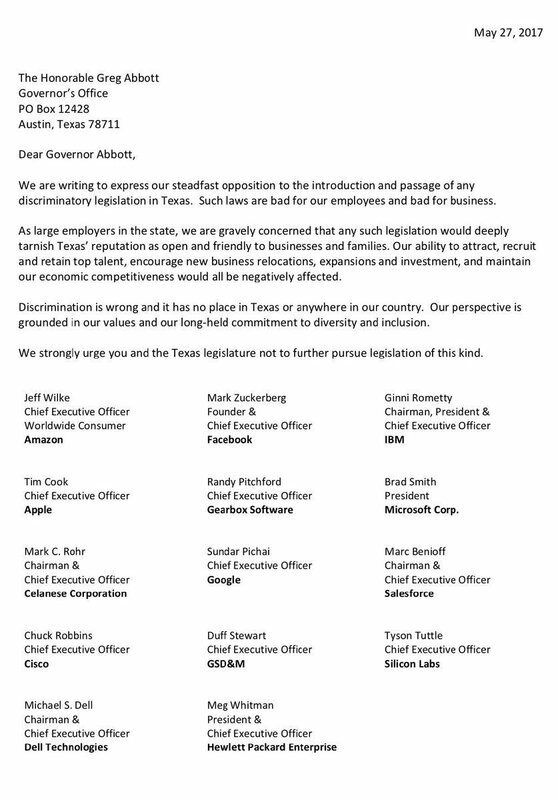 "As large employers in the state, we are gravely concerned that any such legislation would deeply tarnish Texas' reputation as open and friendly to businesses and families", begins the tech companies' letter to Abbott. "Our ability to attract, recruit and retain top talent, encourage new business relocations, expansions and investment, and maintain our economic competitiveness would all be negatively affected." "Discrimination is wrong and it has no place in Texas or anywhere in our country," the letter continues. "Our perspective is grounded in our values and our long-held commitment to diversity and inclusion." This isn't the first time the tech industry has taken a stand against issues arising from Trump's controversial transgender policies. With much of Silicon Valley also vocally supporting a 17-year-old transgender student's legal battle and opposing similar legislation in Northern Carolina, this latest intervention continues to show the industry firmly sticking to its guns. As a considerable amount of the comments left on this article violated our rules and guidelines, the comments section of this article is now closed.